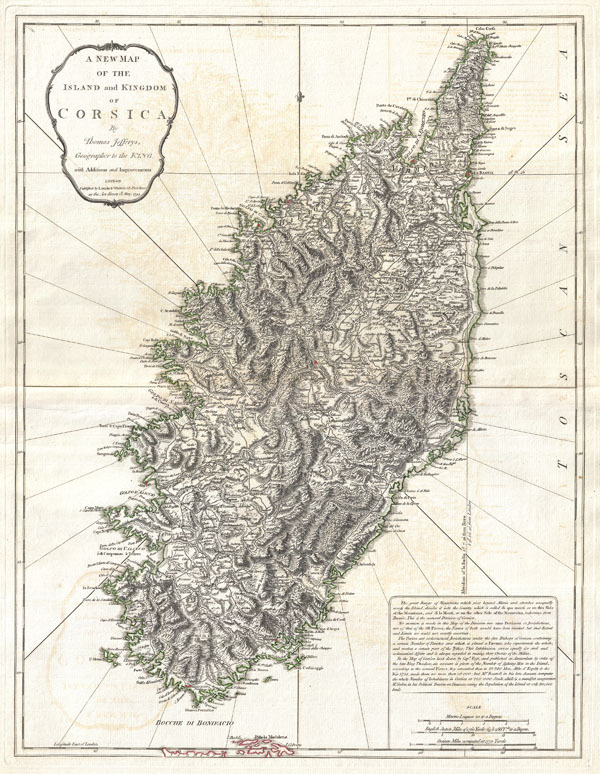 A New Map of the Island and Kingdom of Corsica. An extraordinary 1794 map of the Island and Kingdom of Corsica. Covers the entire island in extraordinary detail offering both topographical and political information. With its unique blend of dramatic mountains and stunning pristine beaches, Corsica is considered to be one of the world's most beautiful places. A note in the lower right hand quadrant discusses the geography and population of the island. Prepared by Thomas Jefferys and published by Laurie & Whittle in Kitchin's 1794 General Atlas. Very good condition. Original centerfold. Light offsetting. Else fine. Rumsey, 2310.035. OCLC 7160203. Phillips (Atlases) 699. National Maritime Museum, 375 (3rd ed. 1801).